In this lesson, we will look at turnarounds (aka turnbacks) and their various variations as applied to major keys, minor keys, suspended resolutions and other progressions. A turnaround is a series of chords that helps bring a chord progression back to the tonic key and is usually found at the end of a tune. In the case of the examples in this lesson, our turnarounds are being used to bring us back to the tonic keys of C major or C minor. The practice of turning around a tune started when jazz players became bored with chords that lasted for two bars or more, most of which were found in the last two bars of the tunes they were playing. These players thought up new ways to take a long tonic chord and play other chords on top of it to take the harmony to a different place before bringing it back to the tonic chord. Turnarounds are most commonly used during the last two bars of a piece, but they can be used in many situations. The first three bars of the blues and rhythm changes, for example, are turnarounds. In the audio files below you will hear common comping patterns over each of these chord progressions. To keep things practical, the chord voicings on the chart are written as you would see them on a lead sheet: G7, Dm7, Cmaj7, etc. But, as in any practical situation, those chords can be embellished with 9ths, 13ths, 6ths, and other color tones. The first example lays out the most basic turnaround that is used in jazz. Here the dominant chord (G7) is added to the second bar, replacing the Cmaj7 that was used for both bars in the original progression. This additional chord produces tension that is now resolved at the top of the tune when we return to the Imaj7 chord. In the next example, we will add the iim7 chord (Dm7) to the second bar along with the G7 chord. In jazz theory, one can always add a iim7 chord to a bar that has a V7 in it or vice versa and one can choose to solo over either or both of those chords in the measure that they occur. Now that we have filled up the second bar we can add a second chord to the first bar. 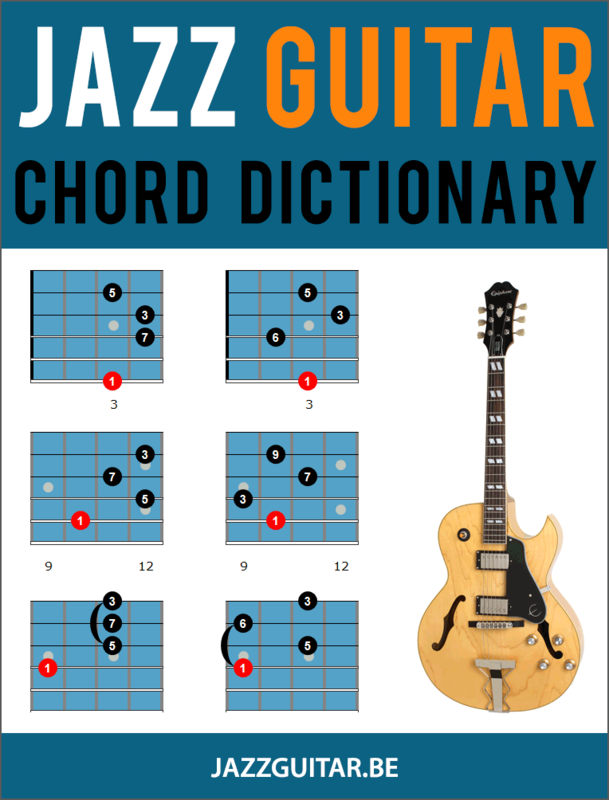 The Am7 chord is the vim7 chord in the key of C major and is the most common chord found between a Imaj7 and iim7 chord in the jazz idiom. Listen to how the bass movement is much more interesting now that we have four chords within a two-bar phrase. Even though we are still only technically playing C major for two bars, the added bass notes really create energy and movement within those bars. The next example contains what is commonly referred to as the VI dominant chord. We are adding it in place of the Am7 chord (the vim7) which leads into the Dm7 chord. The reason this works is that A7b13 is the V chord of Dm7. So we are using “secondary dominant” chords (like Bach would do). The secondary dominant is the dominant of the dominant of the tonic. Now we will add another secondary dominant, this time the Dm7 (iim7) will become D7 which is the V of G7. This produces what is referred to as a chain of dominants as we now have the progression Imaj7 followed by a cycle of fifths movement for three chords producing a V of V of V7 progression. This progression is quite common in jazz. The B section of rhythm changes uses this concept. The following examples will cover turnarounds that use tritone substitutions. Any dominant 7th chord can be substituted by a dominant 7th chord a tritone away. The reason that tritone substitution works is that both chords share the same 3rd and 7th notes. The tritone substitution of G7 is Db7. G7 shares the tones B (3rd) and F (7th) with Db7: B (7th) and F (3rd). Aurally speaking, the 3rd and 7th are the two most important notes of any chord in jazz because they tell us whether the chord is major or minor (the 3rd) and whether or not it is a maj7, min7 or dominant 7th (the 7th). In this first example, we will substitute the last chord in the I/vi/ii/V progression (G7) with its tritone chord (Db7). Notice how the Db7 moves by a half step back to the tonic chord, Cmaj7. It is because of this movement that this sub is often referred to as the “flat 2” chord because it is the bII7 chord in the key of C major. Now we will substitute the D7 chord (this is the secondary dominant discussed earlier), with its tritone chord (Ab7). Here the Ab7 acts as a bII7 chord resolving to the G7 chord. Because of this, the tritone of II is often referred to as the “flat 6” chord (bVI). Here we are substituting the VI7 chord (A7b13) with its tritone chord (Eb7). Because of its relationship to the tonic, bIII7, this sub is often called a “flat 3” chord. Now we can use multiple tritone substitutions in our turnarounds. In the next example, we use all three tritone substitutions: bII, bIII, and bVI. Notice how even though we are “stepping out” of the key of C major, the progression flows smoothly and resolves nicely when it comes back to the tonic Cmaj7 chord at the top of the form. So far we have looked at adding subs for the vi, ii and V chords in our turnarounds. Now we will look at adding substitutions to the Imaj7 chord at the start of our progression. In this first example, we will play an iiim7 (Em7) in place of the Imaj7 (Cmaj7). Notice how this produces a iii/VI7/ii/V7 chord progression, or a chain of ii/V7s. Now we will make the iiim7 chord a dominant 7 chord which will produce a chain of secondary dominants: V7 of V7 of V7 of V7 to Imaj7 at the top of the form. Sometimes the E7 chord will have a b13 (C) in the voicing to help keep it connected to the original Cmaj7 chord that it is substituting for. In this next example, we will use a tritone substitution (Bb7) for the E7 chord which acts as a bII7 chord leading to A7b13. Because of this movement and its relationship to the original key of C major this sub is often referred to as the “flat 7” chord (bVII). The first example shows what is commonly known as a backdoor turnaround or backdoor progression. This is where the tonic chord is stated in bar one (Cmaj7), then a ivm7 (Fm7) and bVII7 (Bb7) chord are used to bring the progression back to the tonic chord. This progression is found throughout the jazz standard repertoire in songs like Stella by Starlight and Lady Bird. The next example adds a V7b9 of the ivm7 chord in the second half of the first bar. This produces a secondary dominant which resolves to the ivm7 chord at the start of the second bar. This next example is what is commonly referred to as the “Ladybird” turnaround as it comes from the last two bars of the tune written by Tad Dameron. The progression uses the tritone substitutions of the vi chord (Ebmaj7), the ii chord (Abmaj7) and the V chord (Dbmaj7). Though in this case all of the chords are voiced as major 7 chords instead of the dominant 7 chords we saw in earlier examples. The next example comes from a Joe Henderson blues tune called Isotope. Here the first bar is a standard I7 VI7 progression, the I is a dominant 7th chord because the tune is a C blues. The second bar steps out a little more, but all four chords are related to the notes of a C diminished 7 chord. The notes of the Cdim7 chord are C, Eb, Gb and A, the roots of the four chords in the progression. What Joe has done is harmonize the descending Cdim7 arpeggio with dominant 7th chords to produce a new and exciting way of turning a tune around. This next example is used when the chord at the top of the form is a iim7 chord, as in But Not For Me and other standards. Here the Em7b5 and A7b9 are the ii and V chords leading to the Dm7 at the top of the form and the F7 chord is a tritone sub that resolves to the Em7b5 chord. In this section, we will look at turnarounds that occur in minor keys, in this case, the key of C minor. The first example is of a standard turnaround in the key of C minor using a im6/vim7b5/iim7b5/V7alt chord progression. Notice that in minor keys the vi and ii chords are always m7b5 voicings, which is different from the vi and ii chords in major keys. Now we will apply a tritone substitution to the vim7b5 chord making the second chord of the turnaround an Ebmaj7 chord. In this case, we choose to use an Ebmaj7 and not an Eb7 chord because the maj7 voicing is the relative major chord in the key of C minor which makes it closely related to the tonic key. In the next example, we apply the tritone substitution to the iim7b5 chord to produce an Ab7#11 chord. We specifically use a 7#11 voicing because the #11 (D) is both in the key of C major (the 9th) and the chord G7alt (the 5th). This helps link the chord to the key we are playing and gives a smooth resolution to the next chord, G7alt. In the last minor example, we apply the tritone substitution to the V7alt chord resulting in a Db7#11 voicing. Again the 7#11 chord is specifically used because the #11 (G) relates it to the key of C minor (the 5th) and to the chord it is subbing, G7alt. Sometimes the best sounding turnarounds are the ones that are the least complicated. In these next examples, we have what I call “one chord turnarounds” or what some books called suspended resolutions. In this concept, we take chords from the flat keys, Db (bII), Ab (bVI), Gb (bV), Eb (bIII) and Bb (bVII), and sit on these chords for the whole two bars of the turnaround. This creates a suspended sound that lifts the listener’s ears outside of the expected harmony but brings them nicely back into the tonic key with the Imaj7 chord in bar one of the tune. The next example works well because the tonic (C) is the 7th of the chord and the #11 (G) is the 5th note in the tonic key of C major. This example works well because the tonic (C) is the 3rd of the chord and the #11 (D) is the 2nd note in the tonic key of C major. This example works well because the tonic (C) is the #11 of the chord. This example works well because the tonic (C) is the 6th of the chord and the #11 (A) is the 6th note in the tonic key of C major. This example works well because the tonic (C) is the 9th of the chord and the #11 (E) is the 3rd note in the tonic key of C major. Thank´s a lot, an excellent lesson. Somehow it doesn’t work. I didn’t get the email for the verification. Thank you so much! The examples cited suggest the idea that in alternative harmonization the bass line with its chords can take the lead — outside the main key, while melodic notes serve as connecting hooks to the main key. It’s great to know the progressions and the different substitutions, but it’s just as important to know how to play over these changes. Perhaps that will be the subject of another lesson? But what’s the first thing another musician asks you?What are the Chords and what key is it in? Awesome. I might be the world’s most boring accompanist/rhythm player – this will be a huge help! Fantastic Lesson!Like I say chords are the most important element in any song or music.And knowing how each chord quality sounds like in any key or as many as you can,then your ear doesn’t have as much trouble navigating over complex chord progressions and key changes.